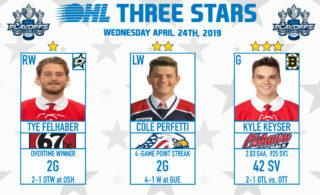 Toronto, ON – The first round of the 2019 Ontario Hockey League Playoffs wrapped up Saturday with the Oshawa Generals becoming the eighth and final team to advance to the Conference Semi-Finals. With their victory, all four second round matchups have been confirmed and for the third straight season they include the top four seeds on both sides. 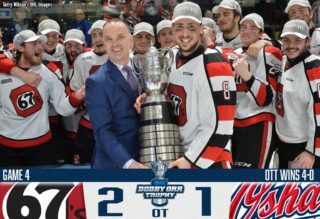 In the Eastern Conference, the OHL’s Regular Season and East Division champion Ottawa 67’s advanced with a 4-0 series win over the Hamilton Bulldogs and will face the fourth place Sudbury Wolves who also advanced with a 4-0 series win defeating the Mississauga Steelheads. 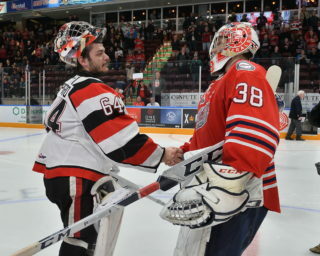 The other Eastern Conference Semi-Final features the Central Division champion Niagara IceDogs who advanced following a 4-1 series win over the North Bay Battalion up against the third place Generals who eliminated the Peterborough Petes in five games. In the Western Conference, the first place and Midwest Division champion London Knights advanced with a 4-0 series win over the Windsor Spitfires and will meet division rivals the Guelph Storm who also advanced by way of a 4-0 series victory against the Kitchener Rangers. 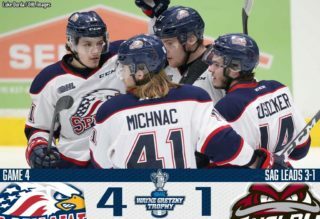 The other Western Conference Semi-Final features two West Division rivals including the banner raising Saginaw Spirit and the defending conference champion Sault Ste. Marie Greyhounds. The Spirit advanced with a 4-0 series win against the Sarnia Sting, while the Greyhounds eliminated the Owen Sound Attack in five games. The puck drops on second round action beginning Friday night, April 5th. Game 1, Fri., April 5, Oshawa at Niagara 7:00 p.m.
Game 2, Sun., April 7, Oshawa at Niagara 2:00 p.m.
Game 3, Tue., April 9, Niagara at Oshawa 7:05 p.m.
Game 4, Thurs., April 11, Niagara at Oshawa 7:05 p.m. Which two teams will advance to the 2019 OHL Eastern Conference Finals? 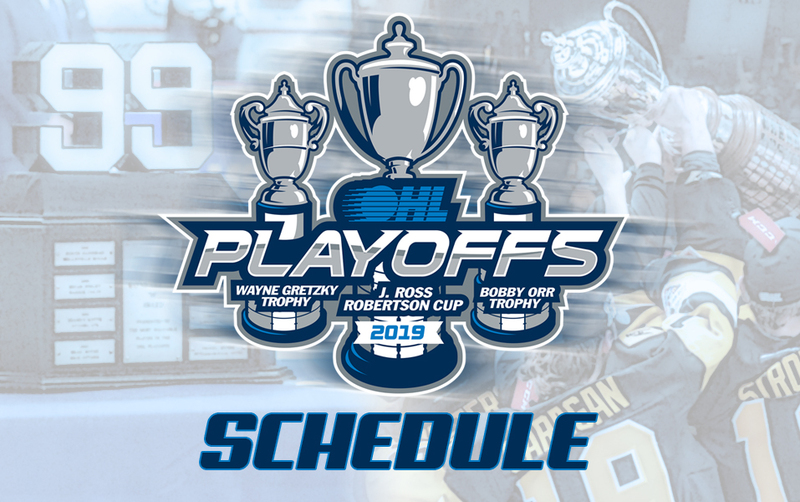 Which two teams will advance to the 2019 OHL Western Conference Finals? The Ontario Hockey League, in association with its digital media partner NeuLion, are proud to offer special packages and rates for OHL Live coverage of the 2019 OHL Playoffs. Powered by NeuLion, OHL Live provides coverage of all 20 teams in the OHL delivering all games throughout the regular season and playoffs. In addition to these packages, OHL Live continues to offer single game passes and are available at a rate of $7.99 per game.